Diary LR110 CSW WRITES: Well, I must admit that Ethiopia and Northern Kenya have been a little bit of a struggle in many ways. My favourite roads are sand tracks as I can really fly along at 50-60mph and it feels like driving on European motorways…lovely. I hate rocky roads and corrugations, along in low ratio 2nd or 3rd gear along roads marked as “improved” but in reality just a hillside of rather large boulders is not good for me. My owner drives me with a fair amount of mechanical sympathy and doesn’t overload me at all compared to the women and donkies we see carrying heavy burdens along the way. I suppose that this is actually what I was built for, but I can’t help dreaming of intimidating mothers and children with my massive bulbar on the school run in Bath. This is one of the things that worries me as well…my owner hasn’t given me a name yet, does this mean he doesn’t care? Does it mean that he is deliberately refusing to build a relationship on any other level than professional as he plans to sell me in South Africa? Will I ever return to the country of my birth? My main allies are the kids and Clare who have all fallen in love with my low key macho strength and unbelievable abilities in difficult situations. I think my owner prefers motorcycles and spends most of his time fantasising about riding these roads on his R80ST. Secretly, I think he hates cars.I must admit that he spares no expense and effort in maintenance and always buys the best of the best oils although he just has to take whatever diesel is available…I’m not exactly the cleanest, most environmentally friendly vehicle in the world, but the high sulphur diesel in these countries cause filthy smoke. Funnily enough I feel at my strongest now, everything has bedded in, my engine and gearbox are smooth and quiet. My fuel consumption is now averaging 32.3mpg, probably due to the slower speeds and the long roads where I spend a lot of time just off tickover in 3rd or 4th gear. I had nearly forgotten that I had a 5th gear until I was near Nairobi. I have done 11,000 miles since leaving the UK and I have felt that nearly every mile has been like 10. I have proved to be 100% reliable and have never failed to start or get my charges through deep mud and sand, up and down rocky mountains and through deep snow. My tyres have been shredded by rocky roads and are really only fit for the bin. All the Land Rovers I meet coming north say that the hard bits have been done and from here on the roads are mostly good. I’m starting to dream at night about lovely British “green lanes” and gentle rain caressing my aluminium skin…..Better sign off now before I get too homesick. Please send me suggestions for my name to my owner, I’m sure he would find it easier to relate to me with a name. I’m tired of being the only Land Rover in the world with no name! 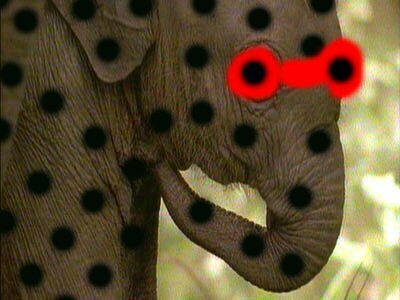 PIC SHOWS RARE TYPE OF AFRICAN ELEPHANT! "SPOTTED" BY ELLA!